Texting My Pancreas: Filling Gaps And Taking Risks. Before I get into the recap, I want to say that I wish more people would have/could have attended. It's not very often that a Midwest city like Omaha gets to have people of this caliber to come speak. I wish the event could have been better promoted (and with much more notice given), as I felt the 40 or so of us that attended were not nearly as many who would have, had they know about this (and had they realized how unique this opportunity was). Attendance was low, and for that, I'm a bit sad. Anyway. *cough* Onto the recap. Linda Johnson spoke about the alliances JDRF has forged with governments, with other disease advocacy organizations, and with industry. She acknowledged that this is a relatively new direction for JDRF (she dated the beginning of such alliances as 2005), and emphasized that these partnerships and agreements can help us more expediently reach better treatments and eventually a cure. Alliances not only can provide a way to pool resources (monetary, knowledge and capabilities) to accomplish what one organization alone may not, they also help minimize unnecessary duplication in the areas of research and development. She mentioned partnering with the Canadian government to secure funding for research ("Hey, if they want to give us $20M to do clinical trials there, we're not turning that down! 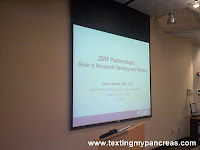 "), and spent a great deal of her time speaking about the various industry alliances JDRF has entered into. 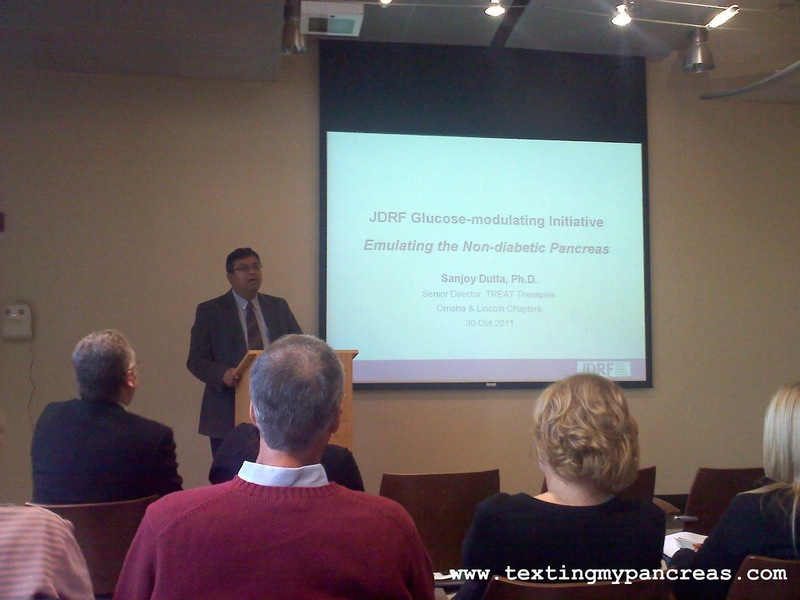 The work Dr. Dutta is involved in (treatment therapies) has two goals: to restore glucose regulation (think Artificial Pancreas [AP] and Glucose-Responsive Insulins [GRI]), and to discover, develop and deliver therapeutics that prevent, reverse and treat complications in all stages and all individuals with type 1. He talked a bit about the AP, and the recent news that patients in Europe have, for the first time ever, successfully used the AP in a real-world setting - that's big news! He addressed some of the "gaps" that need to be filled when it comes to the physiology of a person with type 1 diabetes. Insulin production isn't the only thing "broken" - the production (and body's decisions for appropriate use) of hormones like glucagon, amylin and leptin are also affected. In a person with type 1, glucagon is present in the "wrong place at the wrong time" - meaning that it's missing when we're low and present when we're high. The fix here can't be to simply shut off glucagon production; a balance of suppressing and activating is needed. 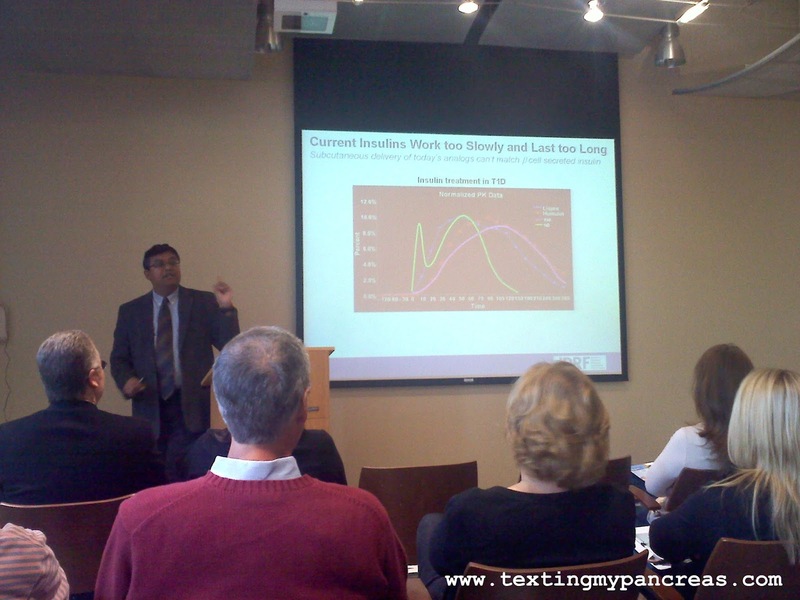 Insulin delivery was another key topic. Dr. Dutta pointed out that current insulin delivery methods, which have insulin arriving in the body subcutaneously (meaning, under the skin), don't make a lot of sense. Think about it - in a healthy human body, does insulin get produced under the skin? (Nope - pancreas.) Does it do it's work under the skin? (Nope - it has to get to the blood stream.) Intra-dermal delivery techniques (which would engage more blood vessels) would also eliminate some of the more common complaints we insulin pump users have, as no tubing would mean no occlusions, kinks, etc. of insulin at the start? 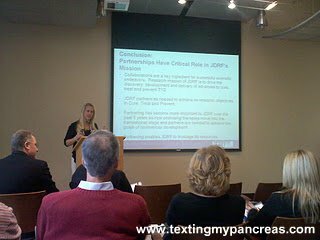 You may already be aware, but JDRF introduced a prize incentive related to GRI as a way to engage a new audience of experts. Dr. Dutta explained that while offering a prize in this arena is unorthodox, it was necessary: "If this were easy to develop, we'd have it already. People have spent time and effort trying to develop GRI but keep failing at it. We need people outside of the "usual suspects", and offering this prize can help us engage with those people." 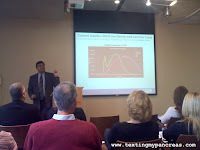 Dr. Dutta left us with these thoughts: if something works (treatment-wise), jump on it. Your best defensive strategy is knowledge, so do your research. You can't expect your medical team to know about everything that's out there, so be an advocate for your own health by being engaged in learning about your disease. And in summary: all of these technologies may not be suitable for each patient. We all have our own unique pathology, and we hope to get to a position where we can pick and choose from these advanced treatments, so that everyone can do what works best for them as individuals. Thanks again to Linda Johnson and Dr. Sanjoy Dutta for spending a little bit of time with us here in the Cornhusker state. I hope they come back again soon. Disclosure: JDRF did not specifically ask me to attend this event or talk/write about it. I was not compensated for my time there or for writing this recap. I am just super nerdy and like to learn (and then share) things like this. As per uzh, my opinions (and translation/recall of events) are my own. Wow! Thanks for this post! This was amazing. I LOVE reading this kind of stuff, because I don't get to these type of functions very often. rock. and. roll! thanks so much for sharing all this great info! Have no fear, I'm nerdy right there with you. Thanks for taking such detailed notes and writing about it. 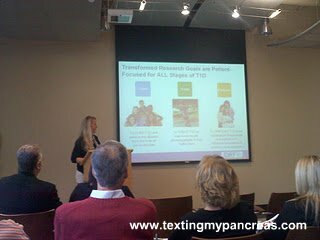 I've been lucky enough to attend a similar JDRF event and heard these stories, along with other research advances like beta cell regeneration. Thanks again for sharing with us. I didn't know much about the InsuPatch before this post. Very cool. This was extremely exciting to read and motivates me to get involved with JDRF in my home state of Virginia. Thank you for posting!!!! I am thrilled to read about the GRI challenge- JDRF should think about blasting that challenge out to MD/PhDs and medical schools engaged in research....wow!